Fringe festival, yes, it’s still happening. Best. Week. Ever. I would recommend Four Clowns except that they had their last performance last night. I had a rather heavy, nervous clown come and sit on my lap. It was excruciatingly delightful. Then Sunday! Seeing shows all day. 7:00 Either seeing Tortoise in Flight by Third Rabbit Dance at U of M Rarig Proscenium or Death Perception by Schroedinger’s Dog at U of M Rarig Xperimental, depending on my mood. 8:30 Encore Performance. These are announced 11pm Saturday at Moto-i and Sunday morning on the Fringe Festival website. I’m hoping for You Only Live Forever Once at BLB. Of course, Friday and Saturday night will be finished off at Moto-i (Fringe Central) and Sunday we’ve got the Fringe closing night party at the Varsity Theater. All fringe staff, volunteers, audience members and friends are welcome at both. All of this will be followed by taking Monday off, and sleeping. Hypothetical Wednesday night Fringe plans with awkward formatting from cutting and pasting, for which I apologize. The Great Midwestern Drug Circus from Sean Neely on Vimeo. (I can’t seem to get wordpress to let me embed this. GRRR! Maybe it just isn’t working in the preview & will kick in when I publish…hmm nope) Anyway, Umm yeah, so…this is weird. Which is why it is so, so awesomely fringeworthy. In the fringe-for-all 3 minute preview, the cardboard elephant got karate-chopped in half in a demonstration of a feat of unusual strength. I gave it 4 out of 5 kitties* on my “do I want to see this” scorecard. 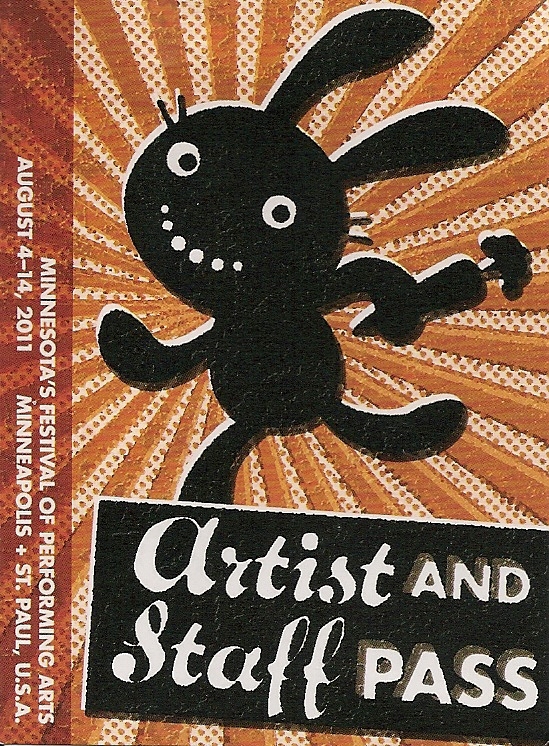 More Minnesota Fringe Festival news and recommendations coming soon! I already have a freakishly long list to divulge. Will try to make it more concise so as not to overwhelm those who are not quite as obsessed dedicated as me. P.S. Our Placemaking project at the Friendly Streets Initiative Block Parties is going well! My group is presenting our pLaYMaGinAtiON sPaCE project at one more block party on August 19th. The other artist’s projects are also very fun and worth checking out. I’ve posted some photos of the shenanigans so far which can be found over here on my facebook page.